The rate of usage of contraception in the world stands at an average of 63.6%, with the most common method across countries being female sterilisation (tubectomy). China witnesses a high prevalence of contraception use (partly attributed to the erstwhile one-child policy of the government) at 83.4% while Chad lags behind at just 6.2%. India lags behind the global average with a usage rate of less than 60%. This figure is also lower than the average for Asia, with its neighbours such as China and Myanmar performing better. What Methods of Contraception Are Used Most Across Regions? Advanced economies like Europe and Australia use birth control pills as their most preferred method while the Americas and Asia employ tubectomies. Africa has a considerable degree of internal variation but as a continent, it uses injectibles the most as a form of birth control. Trends show that modern methods have caught up all over the world; however, the onus of contraception is still on women, as all the continents show a high prevalence of methods such as tubectomy, oral pills or injectibles and extremely low rates of vasectomy. Barrier methods such as male condoms and traditional methods like withdrawal and rhythm method also register usage but not in very high numbers. This raises concerns about female reproductive health, especially since the brunt of a pregnancy also falls on the female body. Comparing contraception usage in five economies spread over Asia and Latin America brings out interesting insights. 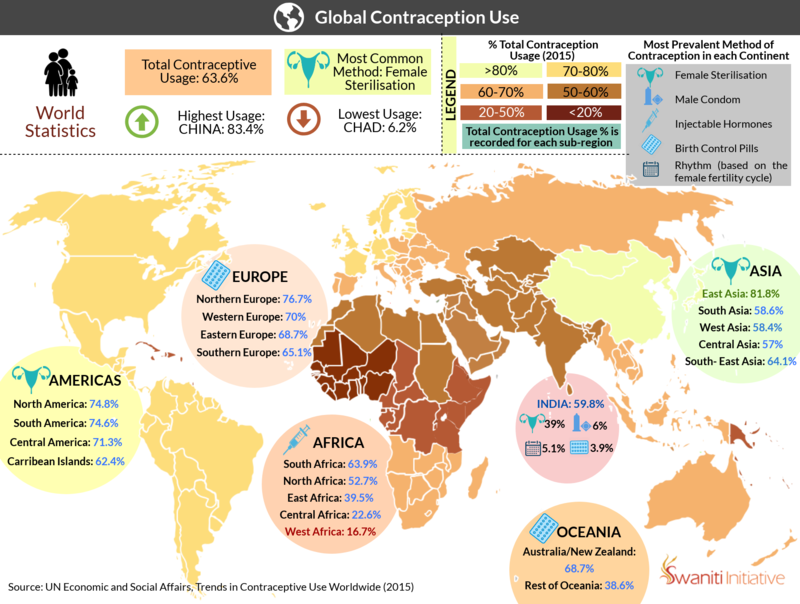 Among India, Bangladesh, Mexico, Brazil and China, usage of contraception could be compared according to access to education and economic opportunities. These two indicators are measures of female empowerment, and can be used to show trends in contraceptive usage, providing insight into why it is higher in certain regions. A plot of male and female education in these countries show similar trends but correlate negatively with contraception usage in Mexico and Brazil, and even to a certain extent, Bangladesh. However, in these countries, formal, salaried employment of women correlates positively in a dramatic way, thus pointing to the fact that female economic agency, and not education, is a deciding factor in the decisionmaking concerning family planning.